The Devas are Beings of Purity. The Deva of Light is Light. The Deva of Light's aura is an orb of soft, light yellow. She is working with the Ascended Master Mother Mary at this time. The painting at the top is a portal for her energy to flow out to humanity 24/7. It is not available as a card or print. 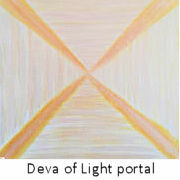 Open your heart to the energy coming from the painting and ask the Deva of Light to help you on your ascension journey.